Elizabeth Davide in action during a game last season. The lacrosse team begins its regular season against Duquesne on Feb. 14. Jimmy Lafakis/Collegian file photo. The new kids on the block are no more. Now entering their third season of play, Butler’s lacrosse players are just regular old kids on the block. And that’s good. But it means that expectations have changed. One-win outputs, such as the ones that have been produced in each of the past two years, were understandable in the past. This year, the same would be considered a disappointment. Even without an increase in wins last season, head coach Cecil Pilson said that the team was noticeably improved. “Aside from the win-loss column, you just really kind of see them actually being a lot more competitive against the teams that we play,” he said. Pilson specifically noted the games against Georgetown and Cincinnati over the past two years. The Bulldogs turned an 18-2 loss to the Hoyas two years ago into a 20-13 loss last year. 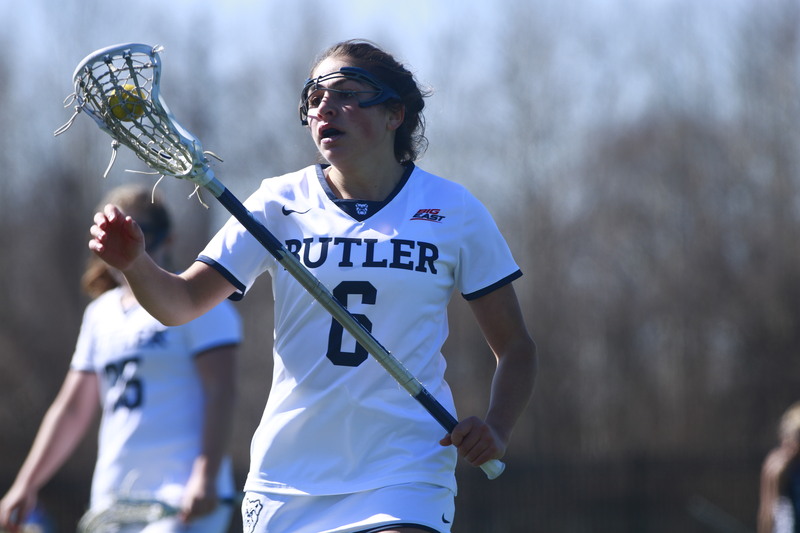 Butler similarly turned a 21-3 loss to the Bearcats into a 14-8 loss. Whether or not the team takes another step forward this year will ultimately be shown on the field, but the process has already started. Senior defender Jordan Fischbach said that the feel is already different this year. Even though the team is more experienced as a whole, the Bulldogs are still young; 28 of the team’s 41 players are freshmen and sophomores. Of the team’s 37 players last season, 32 were underclassmen. Nearly all of the incoming freshmen this season were named to some form of all-district, all-conference, all-division or all-star team in high school. The team is also returning its two leading leading scorers, sophomore attacker Ashley Guerra and senior midfielder Haley Hallenbeck. Whether they can turn that talent into wins and improvement this year will largely depend on the team’s leadership. The team is returning all of its captains from last season and adding an additional one. Pilson says that they’re all more mature mentally than they were last year. He specifically pointed to the development of Hallenbeck. Hallenbeck has been a captain on the team in each of its three seasons and came into that first year as the only player with collegiate experience. “[Her maturity level] shows through her discipline on the field, shows through her discipline in the classroom and it also shows through her discipline as a captain and a leader of the team,” Pilson said. Hallenbeck said the team’s approach on the season can be described by the acronym REAL: relentlessness, energy, accountability and loyalty. One of the team’s goals is to make the Big East tournament this season. That goal will be made easier by the fact that the conference is shrinking from 10 teams to six. Still, it’d be hard not to call Butler an underdog. The team was picked last in the Big East preseason coaches’ poll. In Hallenbeck’s opinion, that only fuels their fire. “We’re really ready to prove that we belong in the Big East, that we belong here and that we can really make an impact,” she said. Butler’s season starts on Feb. 14 with a home matchup against Duquesne. The Bulldogs begin Big East play on March 30 against Georgetown.